We have been working with all sort of visual designing ever since last century, we started our business in 1999. We are specialized in motorsport graphics, especially helmet paintings. We can deliver you your race car and transportation vehicles graphics schemes, logos, driving suit designs, brochures, cards... What ever your team might need! We are also an authorized distributor for world famous Arai and Bell helmets and accessories. Save money and order your helmet and painting from us at the same time! We deliver all over EU district. As you may have seen, this site is not updated too often... Latest news, informations, photos etc. can be found from our Facebook page. You don´t have to a Facebook member, they are open to everyone. Please click "FB" logo on the right side of the page and you´ll be updated what´s new at Evgraphics! 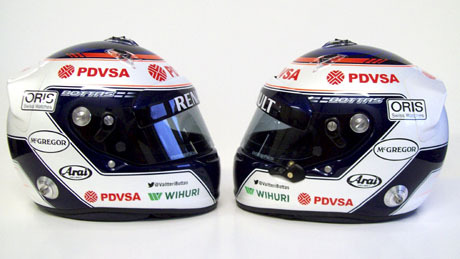 We are proud to deliver F1 racing driver Valtteri Bottas´helmet paintings. The design is inspired by classic, simple look with modern touches. We tried to give sponsor logos as good visibility as possible. Everything is painted, no stickers here! Go Valtteri!! 02/15/2013 Raikkonen switches to Bell! 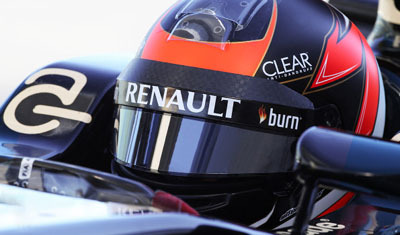 Kimi Raikkonen is the new top driver for Bell Helmets! Did you know that we are an official Bell distributor, you can buy your next helmet with high quality painting service directly from us! Kimi Raikkonen is not our customer. Formula 1 seat for Bottas!